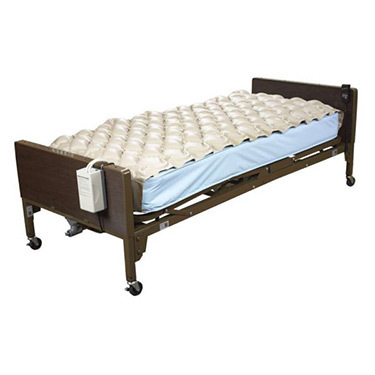 The Med Air variable pressure mattress and pump by Drive Medical has 130 individual bubble cells for maximum comfort and effectiveness. Quiet pump technology alternately inflates and deflates the pads air cells. 4 LPM (Liters per Minute) pump produces consistent air flow and pressure. 5-Minute cycle time. Easy to change filter. Variable Pressure setting on Deluxe Pump allows comfort setting for maximum results. Bubble pad design provides superior therapeutic treatment. Built in bracket for mounting easily to bed. Pad is made of long lasting durable heavy gauge premium vinyl. 1 Year Warranty on the pump. 90 day Warranty on mattress. This is an EXCELLENT product for anyone who is bed-ridden. My mother cannot STAND to be without this variable-pressure pad. Her pain is tremendous without this pad. Pros:This pad helps protect against bed sores and keeps my mother's arthritic back from hurting so much that she cannot sleep. This product is a life saver! Cons:The cats claws CAN puncture this pad -- although the pad comes with a repair kit.